Moving on with LogProcessExceptions tool which externally monitors (debugs, to be more specific) an application of interest and captures its exceptions writing minidump files for further analysis. 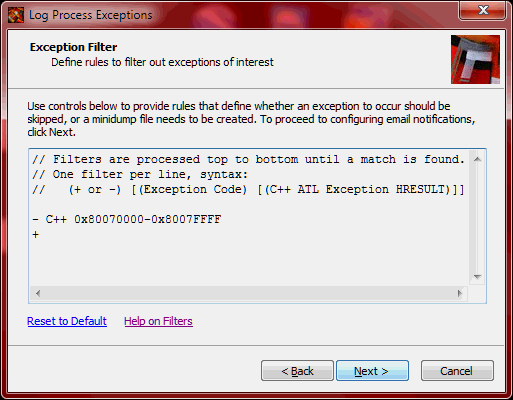 A new property page in the wizard provides one with an option to specify filters/rules to identify exceptions of interest. One rule per line, once exception occurred its codes are compared against rules top to bottom. The first matching rule results in decision whether to log the minidump (and issue a notification) or not. If no filter/rule applicable found, or the entire filter is empty, the exception is logged (positive). Why? Some issues are long to wait, so you don’t want to have it in front of you until the issue takes place. This is when a friendly email from the application would be so much appreciated. The application gets you that by queuing an email once exception of interest takes place. The email settings are basically those of class described on an earlier EmailTools.dll post. The whole SMTP email class is embedded into this application, and it actually deserves a dedicated post on explaining how to embed ATL COM class with persistence based on COM map, which in turn depends on type library expected to be registered, into another application which additionally runs without registration. 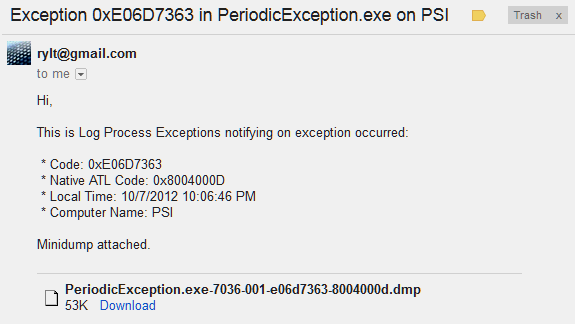 There is a default preset tuned for Google Mail, but there are other options as well. Note that both filter and email settings are saved into registry under HKCU to be reused in next runs of the application. Small minidump files are attached right to the emails. Larger ones (typically those with Full Memory option checked) are only mentioned. There is a threshold setting that defines how many megabytes is OK to attach the most.